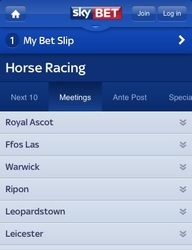 Sky Bet have surprised many by developing one of the best mobile racebook apps available today. 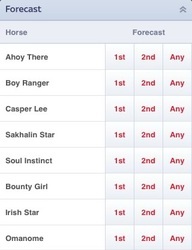 It offers a massive array of racing data that is easily accessible, live video and £10 risk free no deposit bonus. 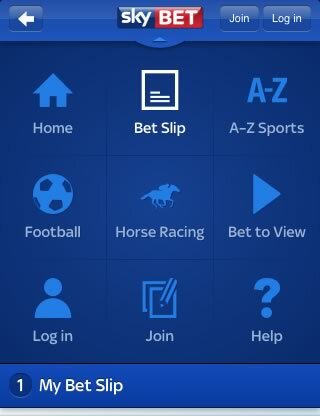 ﻿Following SkyBet's acquisition by another company, the quality of the software has deteriorated greatly. 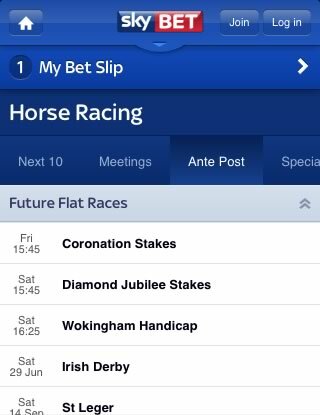 Since the Sky Bet app is now extremely buggy and unstable, we recommend horse racing fans download the Bet365 app instead. 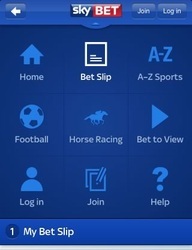 Sky Bet works on Blackberry, iPhone, Android, iPad, Nokia & Windows Phone. Bet on over 600 races every week from any type of internet enabled device. 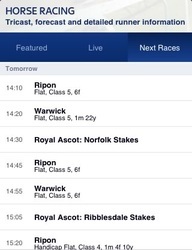 Watch a live video stream of every Racing UK race on iPhone, iPad & Android. Sky Bet is still seen by many to be a relative new comer to the world of betting. Their heritage lies very much in the broadcasting industry, but the betting side of the company is one that continues to grow. The company – Sky Bet – are continuing to make positive strides within the betting industry and one of the main aspects to their success has come in the form of their willingness to improve on products that are persisting to do well. Their latest addition comes in the form of their mobile betting app. This has been an area where they have continued to show improvement over the years and as a result now boast a brilliant betting app. The company started small in the early days, concentrating on just a handful of sports, but now this number has grown and it keeps up with many of the top sports books. One of the key sports to their success has come in the form of horse racing. 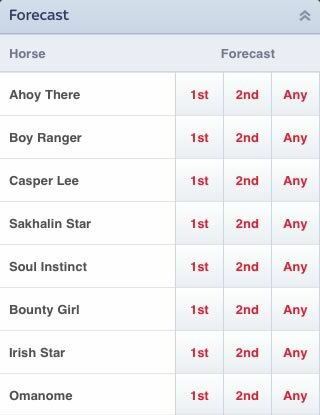 It’s exactly this that we will be looking at throughout this review as we look deeper into the horse racing section of the Sky Bet app. First off, we just want to report how gorgeous this app is. In fact, we are going to stick our necks on the line and say it’s possibly the best looking app on the market. Everything about the app oozes class and the results are simply stunning. But then again, you wouldn’t expect anything less from a product made by Sky. The horse racing section can be found from a number of different avenues. 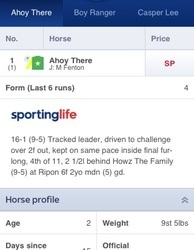 The home page will often show a brief outline of upcoming races once you scroll down but also you can select the A-Z list which will provide you an additional way of reaching the horse racing section. A quick tab includes the next handful of races whilst the drop down menu will also allow you to access these markets along with additional sports. Once into the section, you are greeted with four tabs that include next 10 races, meetings, ante post and specials. The next 10 races tab allows you to get an overview of upcoming races which includes where the race is run, the time of the race, length, age of horses in the race and also the type of race (flat, hurdles, national hunt etc.). 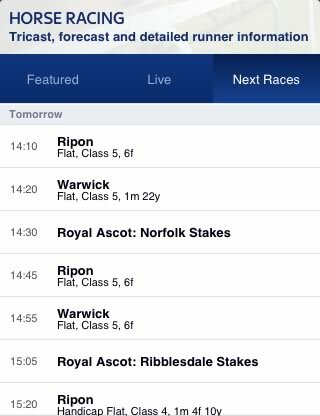 The meetings tab gives you a view of each meeting on offer to bet on. Provided in this section is a drop down menu for each that allows you to quickly see each race including the information listed above. The Ante-Post tab brings up an array of festival meetings and more appropriately, the larger races from those meetings. The specials tab provides a host of ‘other’ markets to bet on. These can range from jockey, trainer, horse, meeting and festival specials, depending on the time of year. This sort of feature is always a positive in our eyes. The race card is where the app really comes alive. Once you have selected your race you will be shown a whole host of information. First off is an overview of the race which includes everything from sponsors, groups, date and time, distance, going and each way betting terms. It’s simply put, but information that most bettors will find of benefit. Just below that you get to see the horses that are running for that race. 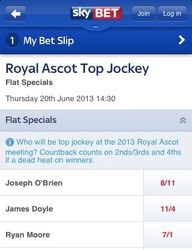 This includes the name of the horse, jockey, current betting price, number and stall draw. These are divided into three sections (number, horse and price) of which each can be sorted with the touch of a button. Another great feature and one so simple, but often overlooked. 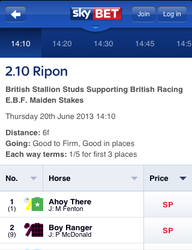 By clicking on the horses name you will be taken to a detailed synopsis of that horse. A snippet from Sporting Life provides you a look at their past races and how they ran. This is actually very detailed considering the small area in which the text is based. Something like this might include ‘Keen led, ridden and edged right 2f out, headed 1f out, no extra inside final furlong’. It gives a great overview as to where the horse’s strengths and weaknesses might lie within a race which is massively important in selecting your horse. From here you can check the horses profile out. This section will have information such as its age, weight, days since last race, official rating, jockey claim, trainer, owner, performance stats and gear. Some of this information may be limited for the lesser horses or horses that are young and haven’t had any rides yet. The more experienced horses with a higher number of races under their belts will yield a larger database to get information from. The final part of the card includes a horse’s lifetime form. This basically shows information such as number of runs, wins, places, win percentage and place percentage. This offers a cracking overview for punters who don’t want to go too deep into their betting analysis but to get a quick grasp of how well it’s ran previously. What this doesn’t include is standard of opposition, so bear this mind if you are looking to solely base your betting decisions from this. 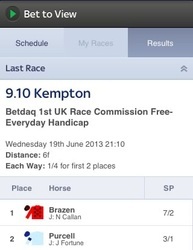 From here you can click the Add to Bet Slip button at the bottom to bet on said horse. 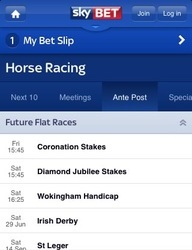 The app also offers a "Bet to View" feature that allows users watch every Racing UK race on an iPhone, iPad or Android device providing they have placed a minimum qualifying bet of £1. Sky Bet offer a unique new player bonus that allows new users try out their mobile sites risk free. If you sign-up with Sky Bet today, they will give you £10 completely free that you can use bet on any sporting event or horse race. You don't need to make a deposit and the £10 will be waiting on your betslip when login for the first time so you literally have nothing to lose. If you continue to place a £5 bet every week, Sky Bet will also match that £5 bet. Sky Bet also run an excellent loyalty scheme that entitles users to £20 in free bets every month. Horse racing fans are especially well catered for every Thursday with a 10% bonus added to all forecasts and a 15% bonus added to all tricasts on EVERY Irish and UK race meeting. With most reviews we often have a good idea with how an app is going to perform based on how successful the bookmaker is. Usually the more successful, the better and more comprehensive the app is. But with the Sky Bet app we were unsure as to what to expect to be honest. Overall, we were blown away. 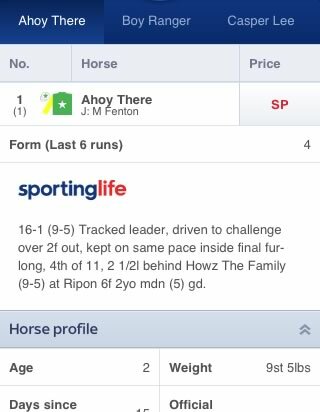 The horse racing section on the app is simply superb. It provides a massive array of information for bettors of all calibre and it’s easily broken down into sections so you can basically go as deep as you please. On top of that, it’s all neatly presented in easily the best looking mobile betting app on the market, which definitely makes life seem that little bit sweeter! 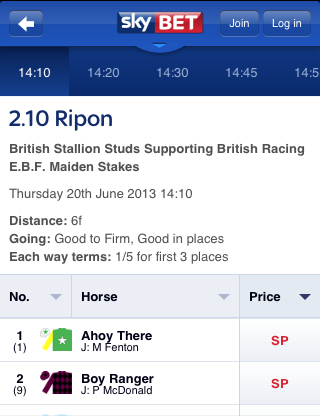 Is it the best horse racing app on the market? Probably not! 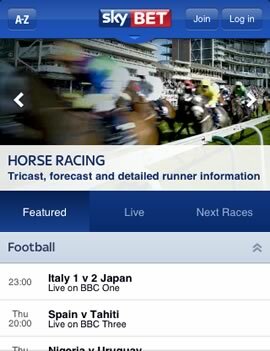 Although the app offers live streaming video of every U.K. horse race, you are currently not able to watch Irish races. Having said that, it will give the majority of horse racing apps a damn good run for its money and its one we would definitely be more than willing to recommend. 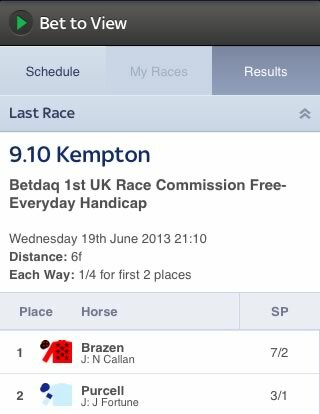 But don't just take our word for it, take advantage of the risk free £10 free bet and find out for yourselves.